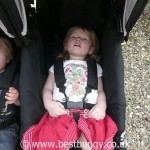 The Easywalker Duo is a very practical pushchair. It looks quite utilitarian, but yet has an understated style. I like the way the strong canvas fabric comes down tightly to the perfectly formed metal footplate, and the simple logos shine out on the baskets. I like the chunky metal wheels and the way they just tuck themselves neatly underneath the footplate. I like the way the suspension springs are on show with the sturdy metal frame running underneath the baskets. The Easywalker is a good balance of function with style and it really appeals. The Easywalker Duo has two good sized padded seats. My tall 2.5 year old easily fitted into the seat unit with plenty of space to grow. Equally my baby looked very comfortable in the seat. The harnesses are easy to adjust and the shoulder pads are a generous length. There are 3 height settings for the harness, and the crotch strap can be brought forwards to accommodate a larger child. The Easywalker Duo seats have 3 settings – upright, slight recline and a full lie back recline. However these reclines are achieved using two long zips on each side of the seat. In order for the fabric to drop down fully, the zips need to be unzipped right to the very bottom of the seat back. The outer zips are easily undone, but the two inner zips involve reaching between folds of fabric and past the weight and form of the children to get the zipper to the very end. This is difficult to do. To achieve a full lie flat recline the process has to be repeated again with the second set of zips. Doing the zips up is even harder, as reaching in & fumbling in the darkness of the fabric folds to locate the small zipper head is not fun. Not only that but the zippers are noisy and would probably wake a sleeping child! I have to say though this was only one of only a few niggles with the Easywalker. My other main niggle is the sun visor on the hoods. The 2 fold hoods themselves are a neat boxy shape which look smart. They offer good shade or shelter even when reclined, and have peekaboo windows. However they have a fabric sun visor made from a mesh which is pale in colour. So it stands out like a sore thumb against a dark colour, like on the black Easywalker that we were testing. To be honest, I think it looks worse in real life than in the photos, because the canvas is such a thick quality material and the visor fabric is so thin. But its not so much the visor that I object to, because the visor serves a function; but my issue is that fact that every single time you pull the hood down, the visor drops down, and you have to spend time tucking it away again. I wish the visors were tied or velcroed into place so that you could choose when to use one rather than them automatically dropping down. There is good storage on the Easywalker Duo. There are huge pockets on the back of the seat units and large baskets with zip down gussets underneath. The baskets were easy to access even when the children were reclined. However the opening is not very wide, so it may be difficult to put a large changing bag underneath, but it would be easy to push shopping, a picnic rug, toys etc under. 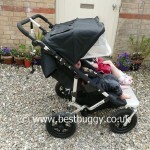 The Easywalker is very easy and light to push with the children on board. The Easywalker manoeuvres very easily and turns well. The handle feels good in the hand and is adjustable to both high and low positions. However, adjusting the handle requires unclipping three clips, adjusting the handle, and then clipping the clips back into place. It is not something you could do whilst walking along, and if the handle is set low, then you may need to adjust the handle upwards to get a neat fold. The wheels easily pop on and off. I had a bit of trouble when one wheel got stuck in fixed position and I simply could not work out how to release it, but Mr BB quickly sorted it out. I did not have an instruction booklet (which probably says a lot about how easy this pushchair is to use if I could use it without one!) I really loved the chunky metal wheel brackets. 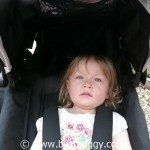 It gave me a lot of confidence in the solidity of this pushchair – in fact I do not think I have seen another pushchair that feels quite as solid and sturdy. The brake is a foot operated one which can be operated from behind either wheel. The large air tyres crossed our thick gravel with ease and I suspect this pushchair is very good off road and on all terrain. I did wonder how you could fit a cosy toes or foot muff to the Easywalker Duo because there did not seem to be anywhere to tie or fit a foot muff or cosy toes to. The seat units are open at the back (the hood covers the opening) and the seat fabric for the recline is held together with a series of velcro tabs. I find these velcro tabs keep the excess fabric very neat, but as the fabric drops to recline, the velcro does undo rather noisily! Not great if your child has fallen asleep upright. You would also have to stop walking to do the recline. 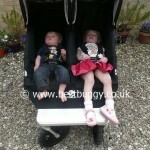 A toggle recline like on the Baby Jogger City Mini & Elite would really make a huge difference to the Easywalker. 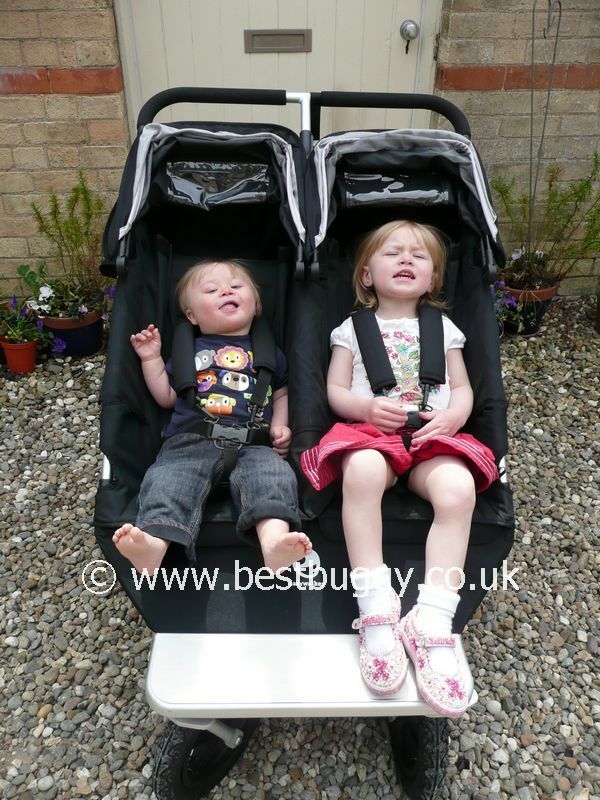 An important feature of the Easywalker Duo is one of the few twin pushchairs that will take two carrycots, and also two car seats, as well as the seat units. The seat fabric simply poppers off and unvelcros, and the carrycot or car seat would then clip into place. 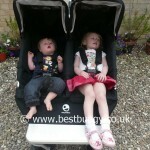 The carrycot requires two bars which run across the frame to hold them into position. The Maxi Cosi car seats fix to the frame using what seem like very simple adaptors. I have to say (again bearing in mind I have no instructions, and I did phone up for help,) they defeated me. Wherever I positioned them, I could not get the popper fitted on and the adaptors hung loose. 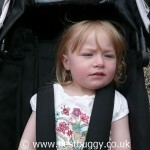 I understand that the adaptors firm into position once the car seat goes on, but I recommend that if you were considering buying an Easywalker Duo, that you get the shop to show you exactly where the car seats clip on and where the poppers attach, on each side, as it really is not obvious! 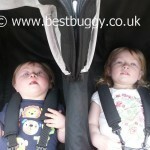 But it is good that the car seat adaptors are simple and small and not large frames. The car seats sit staggered on the frame. Although this may look a little odd, it does mean that the car seats do not add to the width of the chassis (unlike the Bugaboo Donkey where each car seat adds 22cms to the width of the chassis ), thus making it easy to push the Easywalker Duo in and out of shops. I love the footplate of the Easywalker. The shiny metal really sets off the pushchair well. The footplate would be a great place for littlies to sit for a picnic or when getting changed after a day on the beach. I could also see (but not recommend!) older children hitching the odd ride home after a long day at school on the footplate! The fold of the Easywalker Duo was simple to do, and leaves a neat package, if heavy package to carry. But it is a real positive to have everything in one neat package instead of lots of parts. I was surprised how flat the Easywalker went even with the wheels left on. All round, I really like the Easywalker Duo. I like the simple but smart styling. 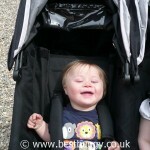 The Easywalker offers a good level of comfort for my children, whilst being easy to push. There is plenty of storage space under and behind the pushchair seats. The harnesses were easy to adjust and the Easywalker was easy to fold neatly. I believe the Easywalker Duo is a very good option either for twins or siblings, which will take them from birth until probably age 4 or 5. 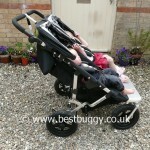 The Easywalker is certainly very popular and I have heard nothing but good reviews about it. Please note, that I discovered later, after the photos were taken, that the carrycot bar had been left in place under the left hand seat (You can see it on the photos). This meant that the seat did not lie completely flat.